As cams and digital video become more critical to law enforcement, their success will be in large part dependent on the ability to efficiently store and access that data. 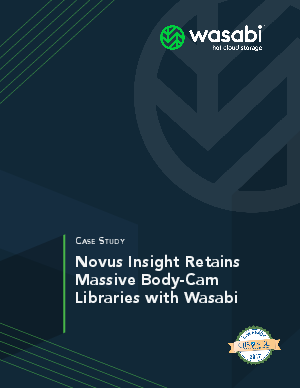 In this case study we look at Novus Insight, a leading integrator of managed video storage for law enforcement agencies, and their decision to use Wasabi Hot Cloud Storage. Novus is tasked with helping law enforcement manage the massive volumes of digital video evidence that body and dash cams are creating. Not a simple proposition for these budget and resource constrained public agencies. After surveying the available options Novus found going with Wasabi an easy choice. Wasabi’s revolutionary storage technology allows for an unprecedented combination of speed, affordability and security. It not only brings Novus the instantly scalable cloud solution they need, it dramatically improves performance and economics at the same time. To learn more about how Novus and Wasabi are helping enable better policing through better technology download the case study.